1. Supports PS2™, GC™ and DC™ controllers on PC simultaneously. 2. Compatible with official PS2™, GC™, DC™ controllers and a majority of compatible controllers. 4. Supports Plug and Play. note : i. PS3™ games are supported, but PS3™ firmware must be updated. Any other non-official controllers or adaptors would not work on those games. ™ joypads are not supported. * function 3 is only workable with driver installed. DC TM Official Arcade Stick. DC TM Official Virtual On Stick – Twin Stick TM. dance mat is not supported. 1. Double click the setup file (.exe) in the floppy disk to install the driver. If you don’t have a floppy drive or if you have lost the floppy disk, please download it from. 2. 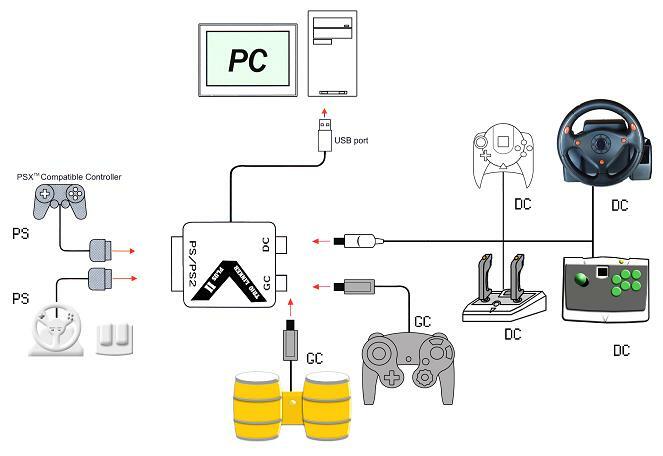 Connect your PS2™ / GC™ / DC™ controllers to the adaptor, and then connect the adaptor to PC (USB port). 3. Go to "Control panel" --> "Game options", you could find one to three joypads inside, depends on how many joypads are connected to the adaptor. 4. Right click the joypads shown in the game options and select "property", the driver interface would pop up. In which, you could configure the key mapping / joy2key / force feedback function. 1. It also works without the official driver, but you would then not able to use the key mapping /joy2key /force feedback function provided by the official driver. 3. Every time after you have connected a joypad to the adaptor, you should reconnect the adaptor to PC, such that the PC could detect the new plugged joypad.